a.k.a. - El Chuncho, quien sabe? The Spaghetti West was a lonely place, where sharpshooting anti-heroes with one word names roamed – coming from nowhere, disappearing to nowhere. One might be forgiven for thinking that every Spaghetti Western featured at least one character like this, however, there were some very different films shot during the Spaghetti boom featuring radical politics and action on a much larger scale. 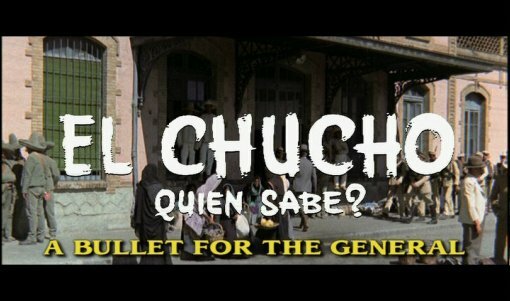 Bullet for the General was one of the first explicitly political Spaghetti Westerns, co-written by Franco Solinas who was also behind the similarly left-wing La resa dei conti (1966). After the very slow opening – the siege of the train is very detailed and lasts a clean 16 minutes – the film speeds up with a near-montage of the revolutionary's attacks on Mexican army locations, then slows down again when the bandits arrive in San Miguel. However, at no point does the film seem overly rushed or slow and enough detail is present throughout to let us follow the storyline and the characters. The script is clever; watching the opening sequence on the train, the character of the army lieutenant is built up strongly and we expect him to be a major player in the film, but he does not last long and the viewer's focus and sympathies are shifted from the army to the bandits. In the train sequence we also realise that something is odd about Bill Tate's motives – but these are not explained until the end, giving the whole film a layer of uncertainty, leading to a particularly effective climax and ending. The only sequence that could use further elaboration comes late in the film when the bandits come under attack, although we assume that the attack comes from a rival band of bandits it is never made clear and the scene does seem like a gratuitous excuse for a gunfight. Despite the focus on politics and his insistance that the film was not a Western but in fact a direct political statement Damiano Damiani does a very good job behind the camera and the screen is continually filled with beautiful Spanish locations and a plentiful supply of extras with a very authentic Mexican atmosphere. The gunfights are well filmed, there is no sharpshooting hero in this film, so instead we get a good number of bandits and soldiers firing at each other, although unlike many later films there is no visible bloodshed. Luis Enríquez Bacalov and Ennio Morricone provide a solid score. Gian Maria Volonté (Fistful of Dollars) plays El Chunco, the charismatic bandit leader and does a very good job. The character varies from wildly over-the-top leadership, to very subdued and caring and Volonté pulls it off successfully. Klaus Kinski gives one of his best genre performances as El Santo, an insane religious man who is more than at home with a rifle or grenade. The rest of the cast look fine in their roles as well. Columbian born Lou Castel (star of the drug trip Italo-Western ¡Mátalo! (1970)) and British actress Martine Beswick (Dr Jekyll & Sister Hyde (1971)) are good as Bill Tate and the love interest Adelita. Damiani's impressively shot film features a particularly well written storyline along with some fine acting from Kinsi and Volonté making it certainly one of the best of the Mexican Revolution Italo-Westerns. The strong political theme is unlikely to be to everyone's taste, but it is well written into the film and is quite unintrusive. Recommended. Any gore or violence ? Quite a lot of gunfights, including a machine gun, no blood. Who is it for? A must see film for any (Spaghetti) Western fans, also a very good film in general, and worth watching. The image is strong - noticable grain and some scratches and speckles but good colours and detail. Audio English language - Dolby digital mono. Sounds fine. Availability Available on its own or as part of the Once Upon a Time in Italy boxset. Other regions? Also available from Koch Media Germany as Töte Amigo including an interview with Lou Castel (in English) and Damiano Damiani (in Italian with German subtitles only) - German and English audio (two versions of the English dub). Also British (with a Damiani interview but poorer print quality), French (with Italian audio, although no English subs for this) and Japanese releases. Cuts? The film is believed to be uncut as per the original Italian print - the film was released in a shorter US print as well as a rumoured longer print (although this is unconfirmed). Titles and credits are in English although the film does not carry US title. A strongly directed and well written Spaghetti Western, one of the most impressive political Westerns. A solid print although sadly lacking in the bonus features present on the German and British discs. Find the other films in the Once Upon a Time in Italy boxset. See our reviews of more Spaghetti Westerns and Klaus Kinski films. All text in this review written by Timothy Young - 15th January 2006 and 16th August 2009.